This paper provides a literature review assessing the performance and issues of delivering construction services in the Vietnam Construction Industry (VCI). The research also explores a potential solution that could improve the performance of the VCI. The results show multiple non-performance issues that the VCI has experienced in the past 15 years, and presents a comparison between these issues and issues from other countries. The results reveal that the top 5 non-performance issues in the VCI include poor design services, frequent design changes, lack of skilled contractors, a lack of experienced project managers, and financial difficulties of owners. The comparison identifies that 87% of VCI issues were also experienced in other countries. Since the VCI has similar issues as other countries, the author propose that the VCI can improve construction performance by implementing successful methodologies from other countries. This paper investigates the Best Value Performance Information Procurement System (BV PIPS) as a potential solution because of two key aspects: (1) sufficient documentation of on time, on budget, and high customer satisfaction from this model, and (2) sufficient testing from other regions and countries to show similar improvement in construction performance. Keywords: Vietnam, Construction, Performance, Best Value, PIPS. Once regarded as an economic disaster, Vietnam is now emerging as the latest East Asian growth engine, which attracts the attention of global investors. Today, Vietnam is currently among the countries with the highest gross domestic product (GDP) growth rates. In 2002, GDP growth in Vietnam hit 7% (high) and recorded the fastest economic growth in Southeast Asia. In 2007, the GDP kept growing to 8.5%, marking the third consecutive year above the 8% benchmark for this small country (Ling & Bui, 2010; Long et al., 2004). That was an all-time high record in terms of growth rate, placing Vietnam second only to China in the Asia region. In 2009, Vietnam was one of the only South East Asian emerging economies not to have gone into a recession during the 2008 U.S. financial crisis. Nonetheless, it had been affected deeply by the crisis as shown in Figure 1 (“Vietnam GDP Growth Rate”, 2017). Since 2013, GDP growth has been recovering and increasing above 6% on average until now. In comparison, the U.S. GDP growth has been 3.2% on average in the past 10 years (Figure 2, “U.S. GDP Growth Rate”, 2017). Figure 1: Vietnam GDP Growth Rate 2001 – 2016. Figure 2: U.S. GDP Growth Rate 2008 – 2016. The construction sectors account for significant economic growth in Vietnam. The Vietnam Construction Industry (VCI) has been growing at 15% annually in the past 10 years. In 2002, VCI comprised 39% of the GDP growth rate. In 2011, VCI increased its contribution to 41.1%. Thanks to the promotion of industrialization from the Vietnamese government and infusing of foreign investments through the Official Development Assistance (ODA) program, construction growth rate has been healthy and consistent over the years (Nguyen Duy et al., 2004; Khanh & Kim, 2014; Luu et al., 2008). However, despite large growth and increasing demand for construction, multiple research efforts in the past 15 years had identified that VCI performance still left a lot to be desired. It is widely accepted that a project is successful when it is finished on time, within budget, and to stakeholders’ satisfaction (Long et al., 2004). A literature research has been conducted to evaluate VCI performance in terms of time, cost, and customers’ satisfaction. Many Vietnam construction projects have faced various problems that have caused significant scheduling delays. In 2009, a research examined 77 projects completed from 1999 to 2005. These projects were in the southeastern area, within cities and provinces where the demand and concentration of building projects were large. It was identified that 75% of those projects were delayed, and 66% of them were over budget (Hoai Xuan, 2016; Luu et al., 2009). In 2009, another study identified that Vietnam projects suffered from over 10% time-overrun of the original construction duration (Le-hoai et al., 2009). In 2012, the Vietnam Federation of Civil Engineering Associations estimated that 99% of investment projects in Vietnam were delayed (Anh Duc, 2012). Disputes between parties are signs of non-satisfactory performance. 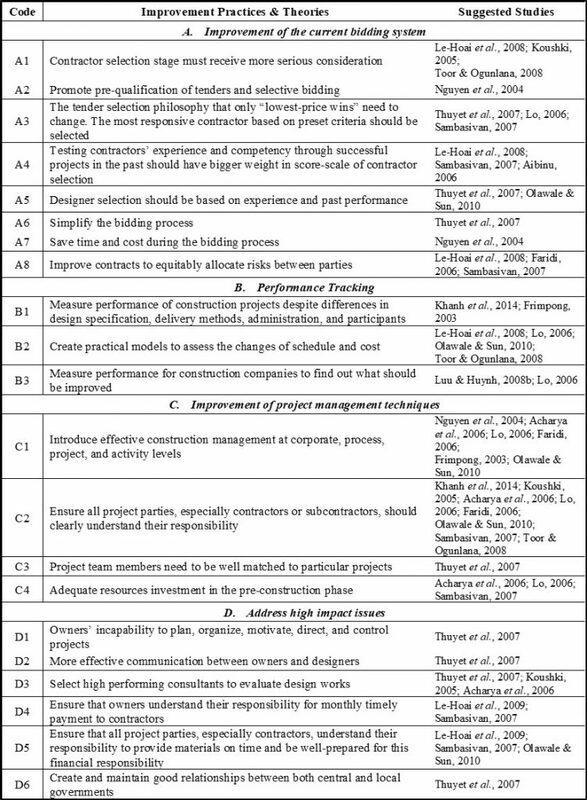 In 2004, a study identified that disputes between construction participants was one of the top causes of project failure in Vietnam (Long et al., 2004). In 2007, another study claimed that conflicts between project owners and government agencies negatively influenced many projects (Thuyet et al., 2007). In 2008, Vietnamese government organizations also acknowledged their dissatisfaction with construction delay and cost overrun problems, especially with government-related funded projects (Le-Hoai et al., 2008). This dissatisfaction was found to be based on empirical evidence showing that public projects in Vietnam usually took longer to complete compared to their private counterparts. This was also consistent with observations in Hong Kong, UK, and Malaysia (Luu et al., 2009). Also in 2008, many problems arose during the implementation of multiple construction projects that caused many citizens to lose faith in the government’s ability to deliver public projects (Le-Hoai et al., 2008). The literature review revealed that there are no studies that identify common causes of non-performance in Vietnam. Such studies are critical since they may help the VCI learn from other countries to identify practices that lead to better performance of VCI projects. This study provides a major literature research and review. The objectives of this study are three-fold: (1) identify poor performance causes of the VCI, (2) identify similarities between poor performance causes of the VCI and the rest of the world, and (3) identify practices that could help resolve those similar causes from other regional and national studies. The author conducted a major review of VCI publications, surveys, and interviews in the past 15 years to identify the root causes of poor performance and prioritized them by appearance frequency. The author then conducted a literature research on publications from other countries to identify non-performance causes that they have in common with the VCI and created a list of prioritized common issues (Figure 2). Figure 3: Compilation of the list of common VCI non-performance causes. The author identified practices and theories from other countries that have been developed to help improve construction performance. The author selected one of these solutions to improve the VCI performance. Many VCI research efforts over the last 15 years have documented poor performance by conducting industry surveys. The author reviewed this research to compile all non-performance causes from past studies. The results are shown in Table 1. Table 1: Sample analysis of data table explicitness. The results are consistent with findings of studies from other geographical regions (Elawi, 2015; Rivera, 2016a; Algahtany, 2017). Most of the problems listed above are a result of human and management error, as opposed to technical limitations (materials, equipment, environmental, etc.) (Algahtany, 2017; Almutairi, 2017). In the case of Vietnam, consultants, contractors, and coordination had caused the most amount of risks while clients/owners caused the most severe risks to projects. It has been estimated elsewhere that 20-40% of capital investment in construction was lost due to poor management for which bureaucracy and briberies were mainly responsible for (Long et al., 2004). The national construction companies rarely paid attention to productivity or time and cost performance of their projects. Because of the lack of competition and hard dependence on production norm, the estimation was not strict. This is the replication of Soviet regime (Luu et al., 2009). Bidding methods are also being questioned. Several studies and interviews identified that poor bidding practices led to hiring ineffective contractors and consultants. Contracts were awarded primarily based on price and rapport of the bidders without consideration of their actual performance. Often, the lowest bidders were chosen to save on project cost. Since tendering is a very sensitive issue, accepting the lowest-price tender was a quick and “safe” way to help the public owners defend themselves from criticisms and to show accountability. Nevertheless, in some cases, bidders submitted the lowest price in order to win the bid and at the later stage, they would negotiate with the owner for change orders to increase their offer. Another problem with bidding in the VCI was unethical behavior and collusion of bidders. Collusive tendering occurred when a number of firms agreed between themselves either not to bid, or to bid in such a manner as not to be too competitive with each other. Incompetent contractors had been awarded contracts with arrangements in the past and they could not finish projects on time and satisfy quality expectations (Thuyet et al., 2007). Other studies from different countries identified that project stakeholders in developing countries face similar problems in spite of different geographic, economic, political and social backgrounds. In the case of Vietnam, 91% (21/23) of issues that VCI had been facing occurred in other countries as well. Table 2 summarizes shared issues between Vietnam and other countries. Table 2: Shared Issues between VCI and other Construction Industries. In 2004, Nguyen et al. claimed that Vietnam, similarly to other countries, did not have adequately trained professionals in project management. Managerial skills were not being fully utilized in the industry. Hence, it is imperative that project management should be improved in the VCI, and there is now a demand for Vietnam to adopt a procurement and project management model with proven performance from other countries to address the current non-performance issues. In addition to studies that identified non-performance factors, VCI researchers have also recommended multiple critical factors that the new project delivery model needed to satisfy to improve the VCI performance. Table 3 is a list of all mentioned factors. Table 3: Required functions of the new VCI project delivery model. CotecCons, Vietnam’s top contractor that specializes in both designing and construction has achieved high performance and success by following the principles suggested in Table 3. According to CotecCons’ Chairman and General Director, Duong Ba Nguyen, CotecCons measured and justified its own performance to minimize the need to blindly trust the owners’ perspective. Nguyen also identified that being prompt with payments was his competitive advantage, in addition to aligning his team members to the right projects and creating a transparent working environment. By applying correct principles, CotecCons has seen success and has become the most reputable contractor in Vietnam. CotecCons’ clients include top real estate companies such as Vingroup, Tan Hoang Minh, and Phat Dat. Their past large projects (>$100M value) include GoldMark City, TimesCity Parkhill, Vinhomes Central Park, and the iconic highest skyscraper in Vietnam, Landmark 81. In 2016, CotecCons’ revenue and profit were reported at $880M and $75M respectively while Hoa Binh Construction’s (second reputable contractor) revenue and profit were $477M and $25M respectively (Mai Linh, 2017; Thanh Tu, 2017). It has been identified that a project delivery model that could satisfy all requirements in Table 3 does not exist in the VCI. Hence, the need to conduct research to identify a model that matches the requirements to improve the VCI arose. In a literature search for potential solutions, to resolve the low performance in the delivery of services, the author identified three landmark studies. A study was commissioned by the CIB, Task Group 61 (TG61), which performed a worldwide investigation in 2008 that identified innovative construction methods with documented high-performance results. The study filtered through more than 15 million articles and reviewed 4,500 of them. In the end, the study found only 16 articles with documented performance results. The Best Value (BV) Performance Information Procurement System (PIPS) was one of three construction methods found in those articles, and it was found in 75% (12 of 16) of the articles (Egbu et al., 2008). The other two methods were the Performance Assessment Scoring System (PASS) and the City of Fort Worth Equipment Services Department (ESD – FT). After further investigation, it was found that although the PASS had measured performance information, the system did not document any improvements in performance of their projects. The ESD – FT had measurements to show improvements of their projects, however, this system did not have documented information for how the process worked. It was also a process that was internal to the organization and did not involve projects with suppliers or other organizations (Rivera, 2014). The Performance Based Studies Research Group (PBSRG) out of Arizona State University commissioned this study, to conduct a follow on worldwide study to the CIB worldwide study in 2008 by Task Group 61 (TG61). The study’s objective was to identify all research efforts and systems around the world that are similar to the BV PIPS, as well as construction performance. The study shifted through hundreds of papers, websites, and personal industry contacts, and found similar results as the first study. In this case, BV PIPS was the only method with documented performance results (Rivera, 2014; PBSRG, 2016). This study was performed in 2013 by a graduate researcher who was interested in identifying the difference between delivery systems. The study reviewed 780 publications in five major databases (EI Compendex, Emerald Journals, ABI/Inform, Google Scholar, and ASCE Library). From the 780 publications reviewed, 103 delivery systems were analyzed and compared. Additionally, 10 company management models were assessed. The top 22 major buyer/supplier theories were identified including: Lean Construction, Supply Chain Management, Total Quality Management (TQM), Just in Time (JIT), Project Management Body of Knowledge (PMBOK), and Conflict Management. After comparing the 133 different delivery approaches, the study found that the Best Value (BV) Performance Information Procurement System (PIPS), was the only model that did not use management, direction, and control to improve performance of the delivery of services, and had documentation showing increased project performance (Kashiwagi, 2013). BV PIPS was the only process that had sufficient documentation showing that it could improve customer satisfaction and value on projects in the construction industry that involved suppliers. BV PIPS is the most licensed university developed technology at Arizona State University or any other project / risk management research group with 55 licenses issued by the innovation group AZTech at Arizona State University. Arizona State University had been identified as the most innovative U.S. university in 2016 and 2017, ahead of schools such as Stanford (#2) and M.I.T. (#3) (“Arizona State University,” 2017). BV PIPS tests have been tested in 32 states in the U.S. and 10 different countries besides the U.S. (Finland, Botswana, Netherlands, Canada, Malaysia, India, Poland, Brazil, Saudi Arabia, and Norway). Documented performance of over 1,900 projects valued at $6.6 billion, customer satisfaction of 9.8 (out of 10), 93.5% of projects on time and 96.7% on budget (Rivera, 2016b; Rivera, 2016c). Arizona State University business services and procurement department tested the PIPS system and generated $100 million in revenue based on the method in the first three tests, and currently receives $110 million a year from using the method. Research tests show that in procuring of services outside of construction, the observed value is 33% of increase of revenue or decrease in cost of 33% (Kashiwagi, 2013). Minimization up to 90% of client’s risk management efforts and transactions due to reduced risk levels and the transfer of risk management and accountability to the vendors (Kashiwagi et al, 2012; Kashiwagi et al, 2014). The results of PIPS testing has won numerous awards: 2012 Dutch Sourcing Award, the Construction Owners of America Association (COAA) Gold Award, the 2005 CoreNet H. Bruce Russell Global Innovators of the Year Award, and the 2001 Tech Pono Award for Innovation in the State of Hawaii, along with numerous other awards (Kashiwagi et al, 2012). The largest projects are $1 billion Infrastructure project in the Netherlands, $100 million City of Peoria Wastewater Treatment DB project; $53 million Olympic Village/University of Utah Housing Project (Kashiwagi et al, 2012). The former Associate Vice-President of Arizona State University Business Services, Ray Jensen, who led ASU to deliver $1.7 billion of services at ASU, commented on PIPS, saying, “I have been successful in the business of procurement and services delivery for the past 30 years. I saw in PIPS, improved solutions of performance/contract administration issues that are so dominant, that I am willing to change my approach to the business after 30 years” (Kashiwagi, 2013). The State of Hawaii Audit (State of Hawaii PIPS Advisory Committee, 2002; Kashiwagi et al, 2002). Two Dutch Studies on the Impact of PIPS (Duren JV & Doree A, 2008). 5% of clients who worked with BV PIPS identified that their projects were delivered on time. 7% of clients who worked with BV PIPS identified that their projects were delivered within budget. BV PIPS is the only identified system with sufficient documentation showing that it can deliver projects on time, on budget, and with high customer satisfaction. BV PIPS has been tested in multiple countries and regions and shown similar results in all of them. The construction industry in Vietnam has been growing consistently in recent years. However, the majority of projects are still suffering from non-performance issues mainly caused by construction participants. Multiple studies have identified the causes of non-performance in the VCI and have recommended directions to improve current delivery method. The BV PIPS model has been identified as a potential solution for issues in the VCI. Due to a limitation in information available, the author recommends that future efforts should be spent to quantify and document the current VCI performance and utilize the expertise of the BV PIPS creator to determine whether BV PIPS can be applied in Vietnam. Due to limited amount of research readily available, the author could not obtain any data post-2014. Hence, the author recommends that a full research should be conducted to update the current VCI performance information and issues. Additionally, further effort should be spent on identifying whether the BV PIPS model truly aligns with the VCI issues, and if the creator of BV PIPS should be utilized for his expertise and advice. Finally, upon verifying the validity of the BV PIPS model, a pilot test could be carried out and studied. Acharya, N. K., Lee, Y. D., & Im, H. M. (2006). Investigating delay factors in construction industry: A Korean perspective. Korean Journal of Construction Engineering and Management, 7(5), 177–190. Aibinu, A. A., & Odeyinka, H. A. (2006). Construction Delays and Their Causative Factors in Nigeria. Journal of Construction Engineering and Management, 132(7), 667–677. https://doi.org/10.1061/(ASCE)0733-9364(2006)132:7(667). Algahtany, M. (2017). Dissertation, Ph.D. “Developing a Risk Mitigation Model for Contractors in the Saudi Construction Industry.” Arizona State University. Almutairi, S. (2017). Dissertation, Ph.D. “Assessment and Development of the Saudi’s Contractors Classification System.” Arizona State University. Anh Duc. (2012). 99% construction projects are delayed due to poor management? Retrieved April 1, 2017, from http://www.nguoiduatin.vn/99-du-an-xay-dung-cham-tien-do-do-quan-ly-long-leo-a24695.html. Arizona State University. (2017). Retrieved April 8, 2017, from https://about.asu.edu/rankings. Duren, J. van, & Dorée, A. (2008). An evaluation of performance information procurement system (PIPS). Incomplete. Egbu, C., Carey, B., Sullivan, K., & Kashiwagi, D. (2008). Identification of the Use and Impact of Performance Information Within the Construction Industry Rep. The International Council for Research and Innovation in Building and Construction, AZ. Elawi, G. (2015). Thesis, M.S. “Owners’ Perspective of Factors Contributing to Project Delay: Case Studies of Road and Bridge Projects in Makkah province.” Arizona State University. Faridi, A., & El-Sayegh, S. (2006). Significant factors causing delay in the UAE construction industry. Construction Management and Economics, 24(11), 1167–1176. https://doi.org/10.1080/01446190600827033. Frimpong, Y., Oluwoye, J., & Crawford, L. (2003). Causes of delay and cost overruns in construction of groundwater projects in a developing countries; Ghana as a case study. International Journal of Project Management, 21(5), 321–326. https://doi.org/10.1016/S0263-7863(02)00055-8. Hoai Xuan. (2016). Construction delays: Projects are losing capitals. Retrieved April 1, 2017, from http://vietstock.vn/2016/05/cham-tien-do-xay-dung-cong-trinh-chon-von-763-475409.htm. Kashiwagi, D. (1991). Development of a Performance Based Design/Procurement System for Nonstructural Facility System. Dissertation in Partial Fulfillment of the Requirements for the Degree Doctor of Philosophy, Arizona State University. Kashiwagi, J. S. (2013). Factors of Success in Performance Information Procurement System / Performance Information Risk Management System. https://doi.org/10.4233/UUID:D5BD9EFF-7BC9-4257-9227-F6A9261883CF. Khanh, H. D., & Kim, S. Y. (2014). Evaluating impact of waste factors on project performance cost in Vietnam. KSCE Journal of Civil Engineering, 18(7), 1923–1933. https://doi.org/10.1007/s12205-014-1219-2. Koushki, P. A., Al-Rashid, K., & Kartam, N. (2005). Delays and cost increases in the construction of private residential projects in Kuwait. Construction Management and Economics, 23(3), 285–294. https://doi.org/10.1080/0144619042000326710. L. O., Chan, A. P., Chan, A. P., Cheong Yong, Y., Emma Mustaffa, N., Duy Nguyen Stephen Ogunlana, L. O., & Thi Xuan Lan, D. (2004). A study on project success factors in large construction projects in Vietnam. Engineering, Construction and Architectural Management International Journal Construction Innovation, 11(6), 404–413. https://doi.org/10.1108/09699980410570166. Le-hoai, L., Lee, Y. D., & Cho, J. W. (2009). Construction of Time – Cost Model for Building Projects in Vietnam. Korean Journal of Construction Engineering and Management, 10(3), 130–138. Le-Hoai, L., Lee, Y. D., & Lee, J. Y. (2008). Delay and cost overruns in Vietnam large construction projects: A comparison with other selected countries. KSCE Journal of Civil Engineering, 12(6), 367–377. https://doi.org/10.1007/s12205-008-0367-7. Le-Hoai, L., Lee, Y. D., & Nguyen, A. T. (2013). Estimating time performance for building construction projects in Vietnam. KSCE Journal of Civil Engineering, 17(1), 1–8. https://doi.org/10.1007/s12205-013-0862-3. Ling, F. Y. Y., & Bui, T. T. D. (2010). 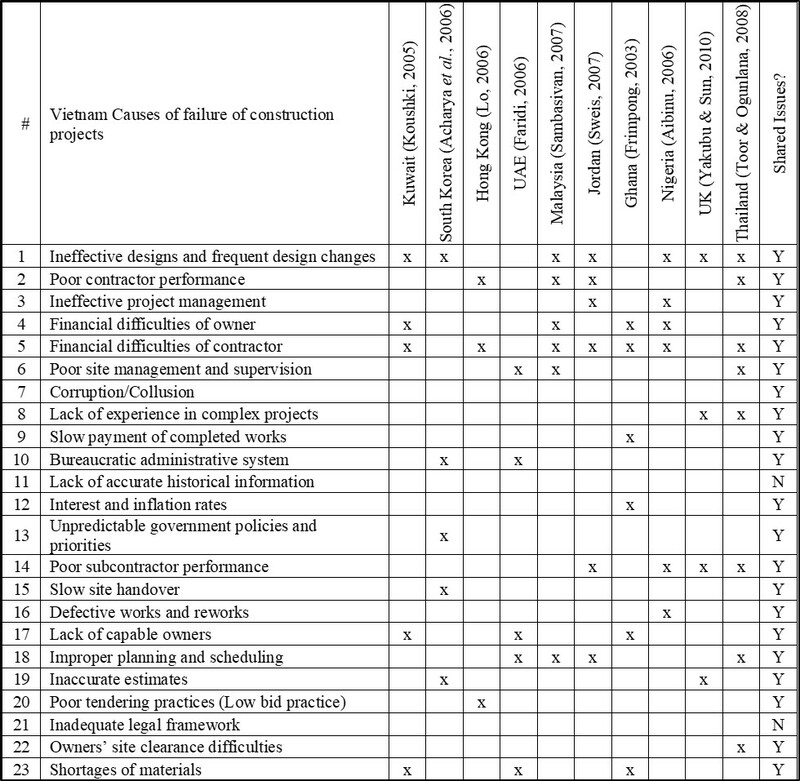 Factors affecting construction project outcomes: case study of Vietnam. Journal of Professional Issues in Engineering Education and Practice, 136(3), 148–155. https://doi.org/10.1061/(ASCE)EI.1943-5541.0000013. Ling, F. Y. Y., & Hoang, V. T. P. (2010). Political, Economic, and Legal Risks Faced in International Projects: Case Study of Vietnam. Journal of Professional Issues in Engineering Education and Practice, 136(3), 156–164. https://doi.org/10.1061/(ASCE)EI.1943-5541.0000015. Lo, T. Y., Fung, I. W., & Tung, K. C. (2006). Construction Delays in Hong Kong Civil Engineering Projects. Journal of Construction Engineering and Management, 132(6), 636–649. https://doi.org/10.1061/(ASCE)0733-9364(2006)132:6(636). Long, N. D., Ogunlana, S., Quang, T., & Lam, K. C. (2004). Large construction projects in developing countries: A case study from Vietnam. International Journal of Project Management, 22(7), 553–561. https://doi.org/10.1016/j.ijproman.2004.03.004. Luu, T.-V., Kim, S.-Y., Cao, H.-L., & Park, Y.-M. (2008). 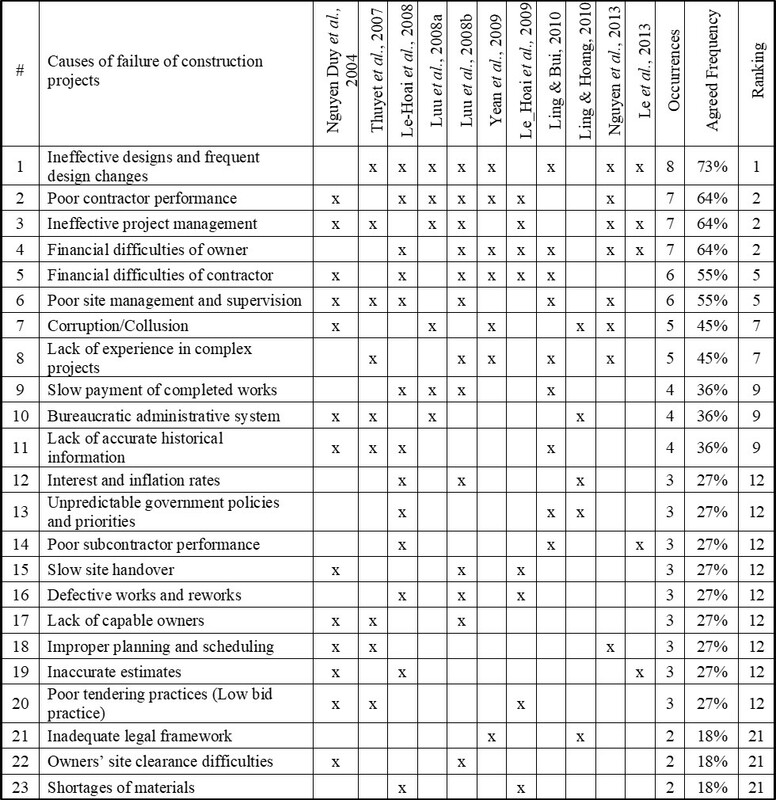 Performance measurement of construction firms in developing countries. Construction Management and Economics, 26(4), 373–386. https://doi.org/10.1080/01446190801918706. Luu, V. T., Kim, S. Y., & Huynh, T. A. (2008). Improving project management performance of large contractors using benchmarking approach. International Journal of Project Management, 26(7), 758–769. https://doi.org/10.1016/j.ijproman.2007.10.002. Luu, V. T., Kim, S.-Y., Tuan, N. Van, & Ogunlana, S. O. (2009). Quantifying schedule risk in construction projects using Bayesian belief networks. International Journal of Project Management, 27(1), 39–50. https://doi.org/10.1016/j.ijproman.2008.03.003. Mai Linh. (2017). Hoa Binh (HBC) proposes to pay dividends by cash with 10% ratio, and by shares with 35% ratio. Retrieved April 8, 2017, from http://cafef.vn/hoa-binh-hbc-trinh-ke-hoach-tra-co-tuc-bang-tien-ty-le-10-co-tuc-bang-co-phieu-ty-le-35-2017040311540982.chn. Nguyen, L. D., Ogunlana, S. O. & Lan, D. T. X. (2014). A study on project success factors in large construction projects in Vietnam. Engineering, Construction and Architectural Management International Journal Construction Innovation, 11(6), 404–413. https://doi.org/10.1108/09699980410570166. Nguyen, T. P., & Chileshe, N. (2013). Revisiting the critical factors causing failure of construction projects in Vietnam. Association of Researchers in Construction Management, (September), 929–938. PBSRG. (2016). Performance Based Studies Research Group Internal Research Documentation, Arizona State University, Unpublished Raw Data. Rivera, A. O., Kashiwagi, D., Kashiwagi, J., & Sullivan, K. (2014). Impact of a Non-Traditional Research Approach Case Study on the Performance Based Studies Research Group (PBSRG). Rivera, A., & Kashiwagi, J. (2016c). Identifying the State of the Project Management Profession. Procedia Engineering, 145, 1386-1393. Rivera, A. (2017). Dissertation, Ph.D. “Shifting from Management to Leadership: A Procurement Model Adaptation to Project Management.” Arizona State University. Sambasivan, M., & Soon, Y. W. (2007). Causes and effects of delays in Malaysian construction industry. International Journal of Project Management, 25(5), 517–526. https://doi.org/10.1016/j.ijproman.2006.11.007. Sweis, G., Sweis, R., Abu Hammad, A., & Shboul, A. (2008). Delays in construction projects: The case of Jordan. International Journal of Project Management, 26(6), 665–674. https://doi.org/10.1016/j.ijproman.2007.09.009. Thuyet, N. V., Ogunlana, S. O., & Dey, P. K. (2007). Risk management in oil and gas construction projects in Vietnam. International Journal of Energy Sector Management, 1(2), 175–194. https://doi.org/10.1108/17506220710761582. Toor, S.-U.-R., & Ogunlana, S. (2008). Problems causing delays in major construction projects in Thailand. Construction Management and Economics, 26(4), 395–408. Tú. T. (2017). Coteccons dẫn đầu top nhà thầu xây dựng uy tín Vietnam Report 2017 – Đấu Thầu. Retrieved April 8, 2017, from http://www.baomoi.com/coteccons-dan-dau-top-nha-thau-xay-dung-uy-tin-vietnam-report-2017/c/21778362.epi. U.S. GDP Growth Rate. (2017). Retrieved April 8, 2017, from http://www.tradingeconomics.com/united-states/gdp-growth. Vietnam GDP Growth Rate. (2017). Retrieved April 8, 2017, from http://www.tradingeconomics.com/vietnam/gdp-growth. Yakubu, O., & Sun, M. (2010 https://doi.org/10.1080/01446190801905406). Cost and time control of construction projects: Inhibiting factors and mitigating measures in practice. Construction Management and Economics, 28(5), 509–526. https://doi.org/10.1080/01446191003674519. Yean, F., Ling, Y., Min, V., Pham, C., & Hoang, T. P. (2009). Strengths, Weaknesses, Opportunities, and Threats for Architectural, Engineering, and Construction Firms : Case Study of Vietnam. October, (October), 1105–1113. https://doi.org/10.1061/͑ASCE͒CO.1943-7862.0000069.